Breville is known for its dedicated electronic home appliances. Coming to juicers, it has more than 50 models for different requirements. Breville is popular in almost all the countries including UK, USA, Asian countries etc. The basic models usually start from $ 40 and can range to a whopping $ 700 for the higher end models. The company is even offering products in the name of Sage appliances in UK, which is also gaining popularity. You can now order Breville juicers from the online shopping stores like Amazon, eBay etc. also. The beauty of the Breville 800JEXL lies in its design. The die-cast steel housing simply looks stunning. Despite its beauty, this juicer is a beast. It is big, fast and solid like a rock. It is run by a 1000-watt motor. No wonder with this much power, it is capable of juicing anything you feed it. The machine can be set to run at the slower 6500 rpm, which is perfect for soft ingredients. Otherwise, you might have let it run at 13000 rpm if juicing hard foods. But all that power means nothing if the juicer cannot take large amounts of ingredients, so it brilliantly integrates an extra wide feed chute. You can shove in 3 whole carrots at once and it will not have any problems. The Nutri disc also does its job effectively. It has titanium reinforced blades and I must say they are good at producing dry pulp, so more juice for you. Cleaning is easy since there are only four parts requiring that task. Nonetheless, you should always clean it immediately as it might be a pain once it dries. There are only 3 things you might hate about the Breville 800JEXL. Firstly, it is large and heavy, so not ideal for small kitchens. Additionally, It is quite expensive. And lastly, it makes noise though not as much as other juicers. It is perfect for everyday home use and would make a great entry level juicer. Many consider this juicer as an upgrade of the Breville 800JEXL. But unlike its brother, this one comes with a powerful 1200-watt motor that spins from 6500rpm-13000rpm. Another difference is that it has a dial switch you can use to change the speed from 1 to 5. Most juicers have a hard time juicing soft fruits. The pulp is usually wet, something many of us do not like since we then have less to drink. To solve this, the Breville BJE820XL comes with two interchangeable discs – a titanium cutting disc and a stainless steel puree disk. The latter is for juicing soft ingredients such as bananas, strawberries and more. The feed chute is slightly larger than the Breville 800JEXL, measuring 3.5-inch. Sometimes you will notice that when you put too much food in the chute, the motor will be stressed and it slows down. But not on this juicer. It has speed sensing circuitry that will automatically increase speed when the motor starts slowing down. The Breville BJE820XL has a heavy grade-die cast metal finish which makes it look elegant and makes it durable. The whole unit feels solid though it only comes with a one-year warranty. Not everyone has a fat wallet to afford the high-end Breville Juicers. For some, it is not justifiable spending hundreds of dollars when all they want is casual juicing. The solution to this problem comes in the name of the Breville BJE200XL. It has a less powerful motor than its expensive brothers, with only 700 watts and runs at a single speed of 14000rpm. This is ideal for juicing hard foods. But it will still suffice on softer ingredients though they need a low speed for maximum extraction. It also comes with an extra-large 3-inch feed chute that accommodates whole fruits. The unit does not have a lot of parts so it is easy to clean and assemble. It even does not come with a separate pulp container. The machine is a bit noisy, but I am sure you will be able to put up with it. It feels solid and looks good as the other Brevilles. You will love it for being compact and light. Its easy cleaning, assembly and speed make this perfect for people who are constantly on the go. It would also be a great asset for first-time juicers. It is difficult to find a juicer big enough for the whole family when you are on a budget. At the low end, the juicers have a small capacity and are less powerful. 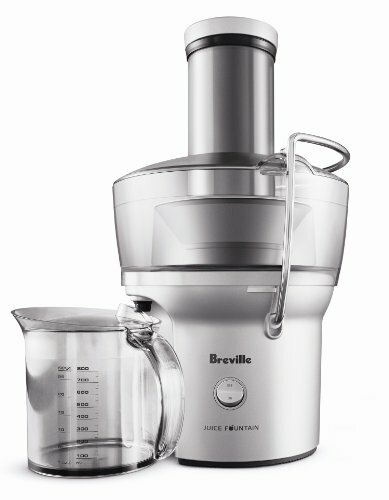 However, with the Breville JE98XL, you will get a large-capacity juicer with enough power. It comes with a motor that has 850 watts. It can run at two speeds: 6500rpm for softer ingredients and 12000rpm for harder ingredients. The feed chute is again large and it measures 3-inches in diameter. Some foods will still need cutting, nonetheless, preparation time is greatly reduced. The juice jug and pulp container are both large. You can adequately juice for the whole family in no time. Cleaning is fairly easy, but you might feel overwhelmed at first as there are many parts that need cleaning. Some of the parts are dishwasher safe. You will find the overhead protection helpful in ensuring that your juicer does not melt. The whole unit is solid and it becomes compact once all parts are fitted. The machine disappointingly comes with a 1-year warranty. But this is not so worrisome since Breville juicers have a reputation for being long lasting. If you are looking for a juicer that is fun to use, you might want to try the Breville BJE510XL. Its somewhat playful design will make the kids want to help with the juicing. The motor is an average one with only 900 watts, which is fairly powerful and will handle tasks without any trouble. It is capable of running at 5 speeds. To make changing speed easy, the juicer has an LCD display. The speeds are Soft food, Citrus, Pineapple, Apple and Hard Vegetables. The entire body is stainless steel. This makes it look good and durable. Its feed chute is like on other Breville juicers measuring 3-inch in diameter. Again, the blades are coated with titanium. The juice jug is quite big as it can hold up to 1.2 liters. It again has the same smart chip technology which increases speed when there is a heavy load to keep the motor from slowing down. Other features are standard like the safety locking arm, detachable spout and large pulp container. If you are into citrus fruits, it makes more sense to get a juicer specifically for that. Though most citrus juicers are cheap, the Breville 800CPXL screams expensive, and it is expensive. One would think Breville spends more time working on how the juicer will look than on anything else. The 800CPXL has not been spared, it simply looks impressive in its die-cast metal housing. With a 100-watt motor, it runs quietly. Surprisingly, it is one of the fastest citrus juicers on the market. It can finish extracting a whole fruit in less than 5 seconds. Another advantage is its ease of use. There is an active arm system that helps you press the fruit on the all-size-fit cone. It comes with two filters, so you have the freedom to choose what gets in your juice. Though it is advertised that the cone takes fruits of any size, it is not difficult to see that it has a hard time with very large fruits. There is still some juice in the pulp that you can use your hands to make it completely dry. Cleaning is easy as the parts are not difficult to assemble and disassemble. If citrus juice is all you need and you have the money, you will love this offering from Breville. The juicers we have reviewed on this list are all centrifugal. These are good because of their speed. But sometimes, you might need thicker juices that retain much of the nutritional value in the ingredients. In that case, you will need a masticating juicer, like the Breville BJS600XL. With a 240-watt motor spinning at only 80rpm, this is the quietest juicer of this whole list. It will take time to finish making your drink when compared with centrifugal juicers. The juice produced is thicker and the yield is more than you would get on a centrifugal juicer. Masticating juicers are particularly good with leafy greens, the BJS600XL is no exception. But it still does a good job with hard ingredients. Since the feed chute is not that big, you will need to pre-chop your food into smaller pieces. Coupled with the slow operation, this one is certainly not for those always on the go. Masticating juicers are either horizontal or vertical, this one is vertical. You will find it a great feature if you have a small kitchen. The machine comes with a number of safety features. It will not operate if other parts are not locked in. Additionally, it has overload protection that stops it from working if there is too much weight on the motor. Because of this, it is advised to avoid putting too much pressure as that will activate the overload feature. If food jams in the chute, you can use the reverse direction control to bring it back up.